Bro. Eli Soriano: Rather Than Waste Money on Firecrackers, Why Not Give? It has been customary to Filipinos and most Asian nations with Catholic leanings to greet the January 1 New Year with a loud bang, in belief that it will help drive away evil spirits and bad omen. Unfortunately, rather than give blessings of prosperity, it only results to a long list of patients seeking emergency relief with their fingers, hand, and other body parts damaged by firecrackers. Bro. Eli posed a new campaign about how best to use the money that people use to buy firecrackers and other accessories for merry-making. “Let us launch a project to prove that there is something better to spend our money for,” tweeted the International Evangelist to his over 36,000 followers. He explained that, “If every centavo used for firecrackers will be utilized to help the poor, it’s more than enough to feed them for the whole year.” Once fulfilled, this campaign would be another first in the list of projects spearheaded by the Members of the Church of God International (MCGI). This is followed by consecutive tweets reminding brethren in the Philippines to find a place with concrete roofs, so they will remain safe from irresponsible people firing guns on New Year’s Eve, which is a common problem in both urban and rural places in the country. In the past year, more than 200 people suffered injuries due to illegal firecrackers and celebratory gunfire. From Dec 21 to Dec 30 alone, as reported by USA Today, the victims of stray bullets have reached eight people while firecracker injuries reached 197. This resulted to 14 amputations, most of which has to live their lives with one or more fingers gone. With the support this proposed campaign by the tele-evangelist will gain, more lives will be saved and more brethren from the Philippines will experience love from their fellowmen. As for the curious individuals wondering why there aren’t any greetings for the New Year coming from Bro. 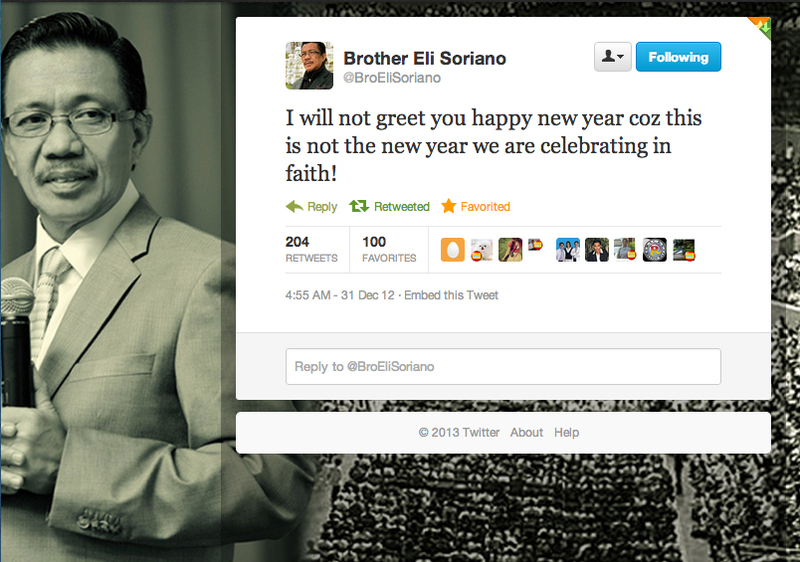 Eli, the MCGI leader tweeted, “I will not greet you happy new year coz (because) this is not the new year we are celebrating in faith!” Others may not be aware, but the calendar followed by majority of nations is the Gregorian Calendar and not the Hebrew Calendar long followed by Christians.